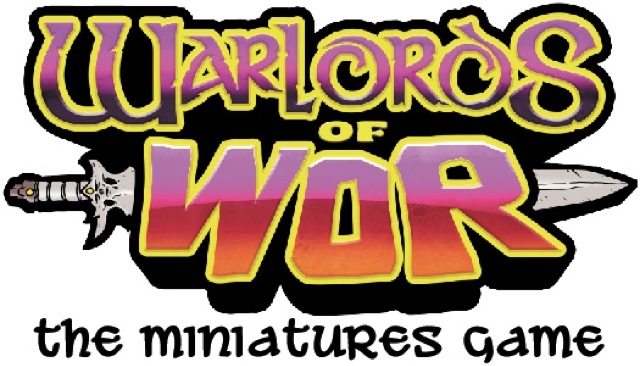 Warlords of Wor - The Miniatures Gamecoming soon! As you know, this Sunday is Super Series Sunday at Tenacious Toys! You didn't know that? Well this Sunday is Super Series Sunday at Tenacious Toys!! That means some cool exclusive toys. This time around it's Kris Dulfer of KiD iNK iNDUSTRY's Wiseman and The Crane blind bagged resin piece. Cast in a rainbow of translucent and opaque colorways, Wise Man and Crane was molded from a very special statue. 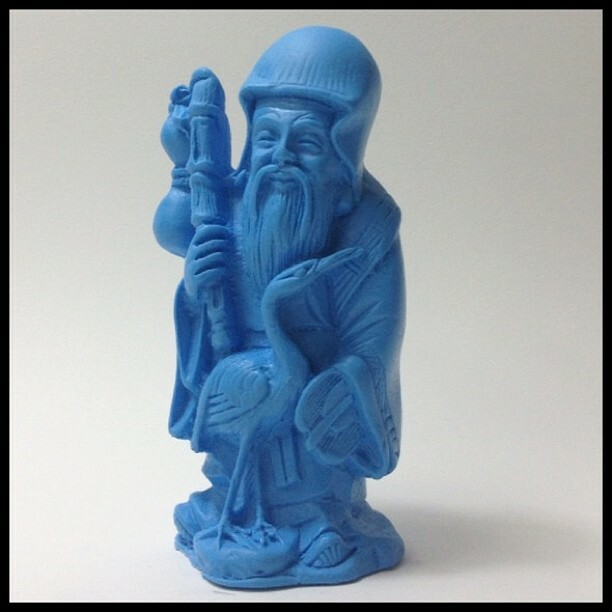 Kris' 3.5" Wiseman and The Crane will available this Sunday, September 15th, at 12pm EST for just $25. BUT THAT'S NOT ALL! The 15th is always an important day for collectors of the Scott Tolleson x George Gaspar Baby Deadbeets series. This time around October Toys have two more to add to your collection, Bruiser and Thrilla. 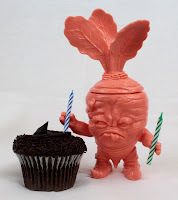 To top it off, a full size Deadbeet will be released on the same day, the Birthday Suit Deadbeet. This one looks perfect for customizers. Both will be available at 3PM EST. 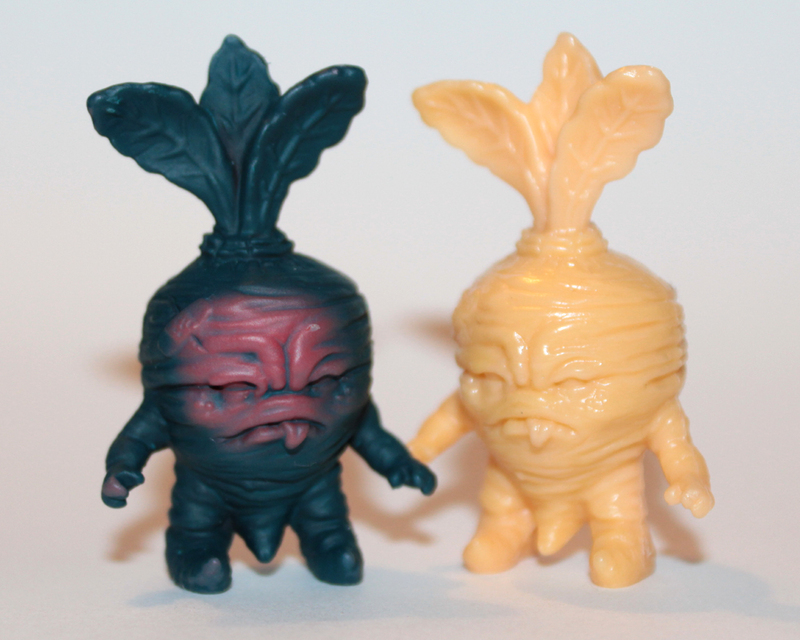 $2 each for the Baby Deadbeets and just $60 for the 7.5" Japanese vinyl Deadbeet. QT The Hedgehog Plush Now Available! A herd (8) of flat, huggable, nerdy hedgehogs are now available at VinylRiot! Flat Bonnie's adorable QT the Flat Hedgehog - Nerd Edition is committed to cuteness with Geek Chic taped glasses and pocket protector, and up for adoption here for only 30$ea. For a limited time, VinylRiot is offering free domestic shipping (on orders 50$) and 14$ flat rate international shipping on orders. How sweet it is! It's the Dudebox Super Amazing Spectacular Collection! It's as good as it sounds! A collection of designs that are all bold and brilliant. 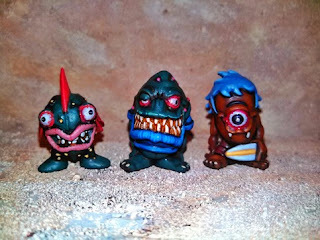 These are all limited edition collectible mini figures that come blind boxed. A “blind box” is a type of packaging that hides its contents. It is like a game of lucky dip, which one will you get? On Scratch, Jonny Wan brings us an alternative colourway and mini version of Crackal*, Andreas Krapf has created an octopus hunter (with his catch), Drunk Park shows us his Bong Jovi and Travis Price has created an x-ray with bit of a special touch (*hint: turn out the lights). Ted has been turned into M.I.L.K. Catbot by Attaboy and Japanese artist Junichi Tsuneoka delivers in his trademark style. 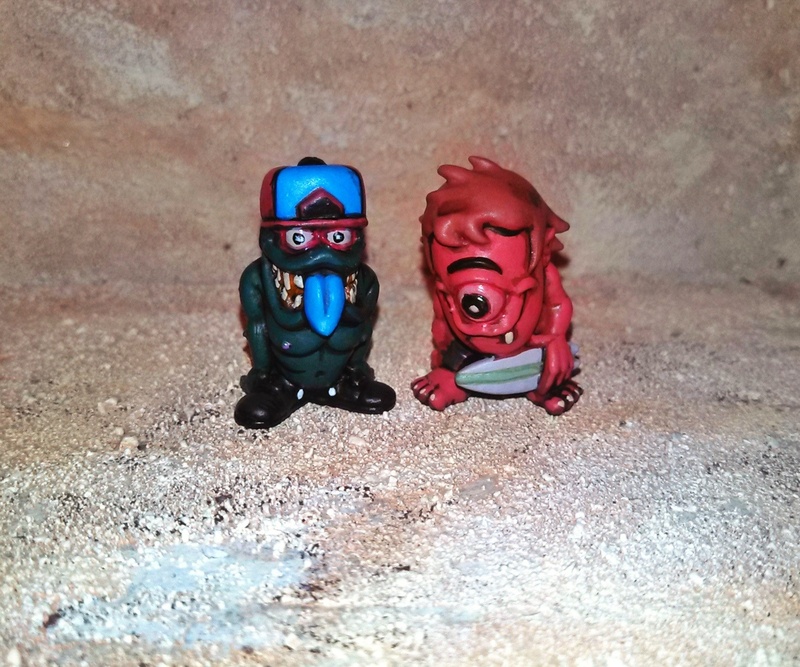 The Dude gets the Suki Bamboo treatment with Frosty, Chauskoskis' Big Red Dude is someone you wouldn't want to mess with, The Yok turns his graffiti style in to vinyl, as does The Dude creator Mark Gmehling with Hip Hop Attitude. 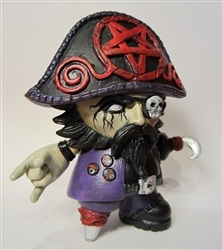 Each figure stands approximately 2.5" tall and are produced by Dudebox. 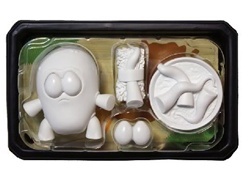 You can pick up blind boxes for $9.95 a piece at the Tenacious Toys online store today. This is the DIY edition of Andrew Bell's O No Sushi. 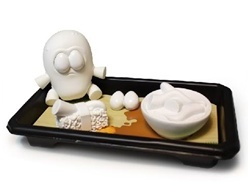 It includes one figure with articulated arms, legs and replaceable eyes, a second set of eyes, one piece of sushi and one bowl of tentacles all in stark white, ready to be painted and customized. The improved take-out tray packaging features a usable sticker tray liner. 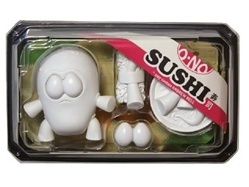 The figure is approximately 3" tall and the packaging is 7" x 5" x 2"
This product is available ow for $22 at the Tenacious Toys online store. These collectible capsule toys have been painted to a high level of detail by hand by Adam Prat. You get one blind bagged figure per purchase. Done in a "Rat Fink" style of paint, these figures would look great in your collection. High quality acrylics and a careful touch have turned these "cheap" toys into little works of art. These are for adult collectors over the age of 15. Each blind figure is available for $12 at Adam Pratt's online store now. You can also follow his blog and instagram to see new and old works alike. This is a one of a kind custom figure from Scott Kinnebrew. 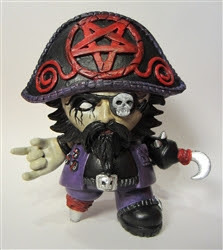 "Blackmetal Beard" is based on the Jon-Paul Kaiser Captain Sturnbrau figure. The figure stands 5" tall and is available now for $150 at the Tenacious Toys online store. This handmade plushie is from the hand and heart of Steph Bomb. Handmade in the United States, the product is 5.5" long and 1" thick. 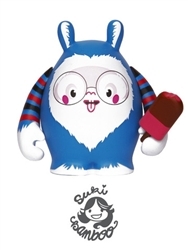 You can pick one up for yourself or a friend for only $75.00 at the Tenacious Toys online store. 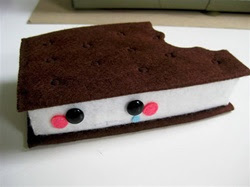 Steff Bomb's plushes ARE NOT FOOD and should not be eaten. They are choking hazards. Do not give to children or anyone with no common sense. TGIF...the 13th!! 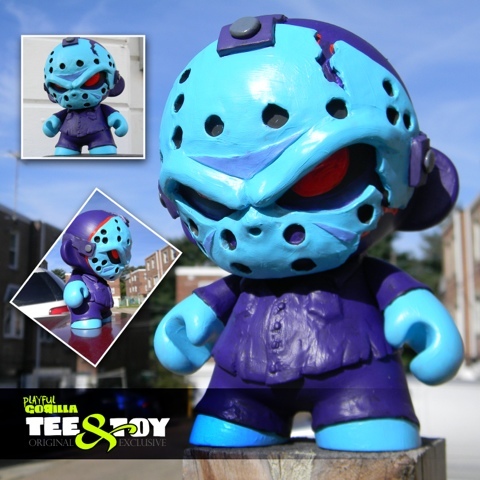 That's right Playful Gorilla (www.playfulgorilla.com) is bringing yet another Toy & Tee release - this time with his homage to one of the most iconic movie slashers we all love to... chhh chhh chhh... haaa haaa haaa to. The shirts will run $20 each or grab both for $36 (includes free shipping in the US and $15 everywhere else) and will include a vinyl sticker. They will be available in sizes ranging from kids onsies to 5XL (Size must be specified when ordering). But whats a Toy & Tee release with out the toy? Each Pre-order will automatically enter you to with this 7" Custom "PG13: 8Bit Nightmare Edition" Munny! So if you get both tees you'll get two chances to win! Available only till September 20th, do hurry - but don't trip while running through the woods to get in on this sale! 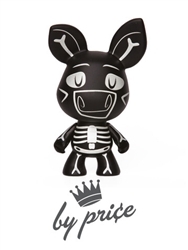 Follow Playful Gorilla for up to the minute information on this dope release and don't forget to stop by BOOTH 208 at NYCC - The Tenacious Toys Collective! 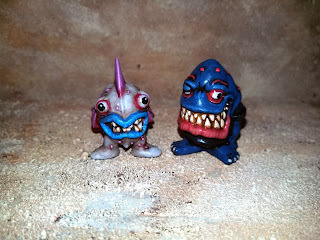 Kaiju Kaos StratoMaxx Kickstarter is live! BACKGROUND: StratoMaxx is inspired by classic Super Robot designs such as Mazinger Z, Gigantor, UFO Robot Grendizer, and Mattel’s Shogun Warriors. The figure also takes on some characteristics from Transformers and Voltron. 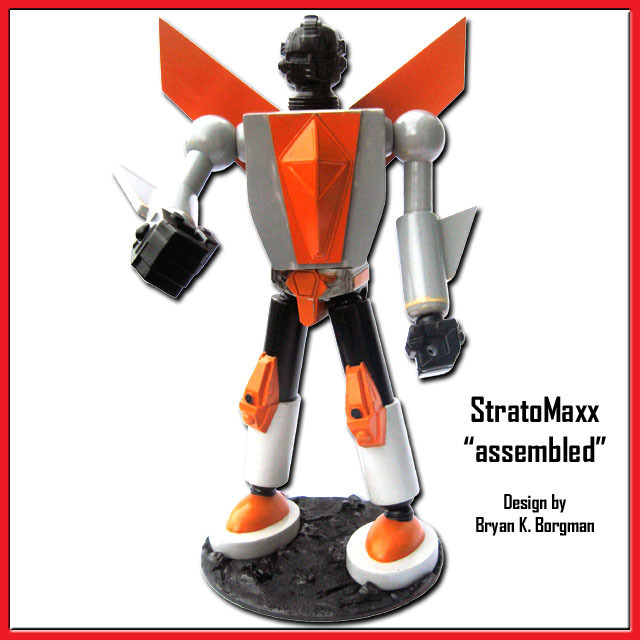 DETAILS: Super Robot StratoMaxx stands roughly 13 inches tall and has a 6 inch diameter integral base. The jetpack wings are 7 inches from tip to tip. WEAPONS: A secondary goal of this project is to fund the materials needed to create sci-fi stylized weaponry. These 28mm (1:56) scale weapons can be used as arm attachments on StratoMaxx and can also be used to convert toy/model vehicles into a more “futuristic” design for use in playing Kaiju Kaos – The Miniatures Game. Each design is handmade by Bryan K Borgman (aka Stratos) and ready to hand cast in a durable urethane plastic by Craig Acheson. "Your support will enable us to take these new designs and put them into production. Lastly, as the Kickstarter video suggests, if we reach our goal, we have a variety of Stretch Goals in mind including new kaiju and other Super Robot designs for some rock’em, sock’em, robot-fighting goodness!" This Kickstarter runs until October 8th at 7:30pm EST- don't miss out on getting your StratoMaxx!